>Susan Dynarski is a professor of public policy, education and economics at the University of Michigan, where she holds appointments at the Gerald R. Ford School of Public Policy, School of Education, Department of Economics and Institute for Social Research and serves as co-director of the Education Policy Initiative. She is a faculty research associate at the National Bureau of Economic Research and the Center for Analysis of Postsecondary Education and Employment. She is a nonresident senior fellow in the Economic Studies Program at the Brookings Institution. Dynarski earned an A.B. in Social Studies from Harvard, a Master of Public Policy from Harvard and a Ph.D. in Economics from MIT. 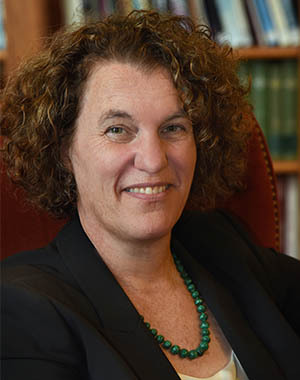 Dynarski has been a visiting fellow at the Federal Reserve Bank of Boston and Princeton University as well as an associate professor at Harvard University. She is an editor of Educational Evaluation and Policy Analysis, former editor of The Journal of Labor Economics and Education Finance and Policy, and is currently on the board of Educational Evaluation and Policy Analysis. She has been elected to the boards of the Association for Public Policy and Management and the Association for Education Finance and Policy, and currently serves as president-elect at the Association for Education Finance and Policy. The National Association of Student Financial Aid Administrators awarded her the Robert P. Huff Golden Quill Award for excellence in research on student aid. Dynarski's research focuses on the effectiveness of charter schools, the optimal design of financial aid, the price elasticity of private school attendance, the relationship between postsecondary schooling and labor market outcomes, and the effect of high school reforms on academic achievement and educational attainment. "Estimating the Effects of a Large Network of Charter Schools Managed by a For-Profit Operator " 2018. NBER Working Paper. Co-authors: Daniel Hubbard, Brian Jacob, and Sylvia Robles. "Tax Benefits for College Attendance." 2016. Education Policy Initiative working paper (March). Co-author: Judith Scott-Clayton. "Are Expectations Alone Enough? Estimating the Effect of a Mandatory College-Prep Curriculum in Michigan." 2016. Education Policy Initiative working paper (January). Co-authors: Brian A. Jacob, Kenneth Frank, and Barbara Schneider. "Stand and Deliver: Effects of Boston's Charter High Schools on College Preparation, Entry, and Choice.” Forthcoming. Journal of Labor Economics. Co-authors: Joshua Angrist, Sarah Cohodes, Parag Pathak and Chris Walters. "The Missing Manual: Using National Student Clearinghouse Data to Track Postsecondary Outcomes.” 2015. Educational Evaluation and Policy Analysis. Co-authors: Steve Hemelt and Joshua Hyman. "Labor Market Returns to Community College Awards: Evidence From Michigan.” 2015. CAPSEE working paper (April). Co-authors: Peter Riley Bahr, Brian Jacob, Daniel Kreisman, Alfredo Sosa and Mark Wiederspan. "An Economist's Perspective on Student Loans in the United States.” 2014. Brookings Institution Working Paper. "Building Better Longitudinal Surveys (on the cheap) Through Links to Administrative Data.” 2014. Prepared for National Academy of Education. "Charter Schools and the Road to College Readiness: The Effects on College Preparation, Attendance and Choice." 2013. Boston Foundation Research Report. Co-authors: Joshua Angrist, Sarah Cohodes, Parag Pathak and Chris Walters. "Financial Aid Policy: Lessons from Research.” 2013 Future of Children (May). Co-author: Judith Scott-Clayton. "Simplifying Tax Incentives and Aid for College: Progress and Prospects.” 2013. Tax Policy and the Economy. Co-authors: Judith Scott-Clayton and Mark Wiederspan. "Experimental Evidence on the Effect of Childhood Investments on Postsecondary Attainment and Degree Completion.” 2013. Journal of Policy Analysis and Management 32:4, pp. 692-717. Coauthors: Joshua Hyman and Diane Schanzenbach. Lead article. Winner of the 2013 Vernon Prize for best article in JPAM. Conducts rigorous research to inform education policy debates in Michigan and nationwide, disseminating best practices in education reform.